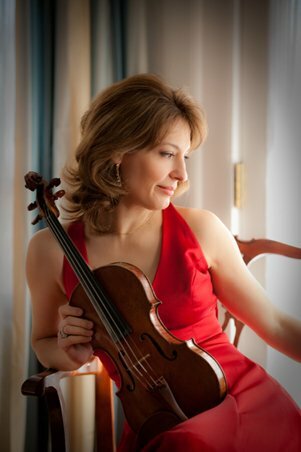 Seully Hall at Boston Conservatory was packed on Sunday afternoon with violinist Irina Muresanu’s friends, colleagues and cheering admirers for her eagerly-awaited “Four Strings Around the World” recital on the String Masters Series. Before I heard Muresanu on the radio earlier in the week, I hadn’t had the pleasure of hearing her live, and the arduous program she undertook was quite an impressive way to make a first impression. The program, the day before the Boston Marathon, was itself a two-hour marathon (there were no losers); most were held spellbound and didn’t budge. Muresanu began her three-part recital with the rarely heard Sonata in D Major for Solo Violin by Sergei Prokofiev (1891-1953), which had all his trademarks, especially of his other two violin sonatas—the haunting melodies, particularly yearning in the slow movement. Muresanu played this, and everything else on this program, with high spirits, crisp rhythm, and impeccable intonation. From music of Soviet Russia, Muresanu moved over to a very Irish sounding piece by Dave Flynn (b. 1977), full of keening and Celtic rhythms, then over to Romania where her compatriot George Enescu (1881-1955) was represented by “Four Airs in Romanian Folk Style.” Originally left in manuscript by the composer, these airs were finally published only in 2006. Muresanu was consistently impressive, negotiating an array of different moods and styles with great élan. After a short break, the tireless violinist returned with three masterpieces, starting with the Paganini Caprice No. 24, which she played with a tremendous technical command that left all in the audience in awe. The violin virtuoso Fritz Kreisler (1875-1962), was represented by his “Recitativo and Scherzo” Opus 6. I hadn’t known of this piece before, and found it quite enjoyable, and yes, very impressive. A violinist in the audience explained that this piece was “awesomely difficult technically,” but by this time we were so used to Muresanu’s tossing off such difficulties that we rarely thought about them. Having solved and mastered every mechanical challenge, Muresanu let the music speak directly. But the most impressive piece on this recital (or any recital on any instrument) was the magisterial Bach “Chaconne” in D minor, which Muresanu played magnificently. When the D Major section moves into D minor, it seemed as if the violin had had its heart broken and was crying. Muresanu’s performance was simply spectacular. After a much-needed intermission, Muresanu changed from a red gown into black pants and sleeveless black top with a turquoise Indian shawl and high heels. She was ready for some fun and, goodness knows, she had earned it. A very Persian “Calligraphy No. 5, Version for Solo Violin” by the so-called “Iranian Bartók,” Reza Vali (b. 1952), full of microtones played meticulously in tune, opened this internationally far-flung set, followed by Ravi Shankar’s “L’Aube Enchantee,” originally written by Ravi Shankar for flute and harp, here played in a double transcription with the wonderful guitarist Aaron Larget-Caplan. Shankar, a world-famous sitarist, wrote little down, which makes this gypsyish piece a bit of a curiosity. The two parts operated in their own spheres, each being interesting in its own way, but I felt it went on too long although each player got to shine and show off their technical prowess. For Chinese-American composer Bright Sheng’s (b. 1955) “The Stream Flows,” a fast country dance, Muresanu ditched the Indian top and wore just her lingerie-ish black top and black pants. She looked and sounded great. Next came the Tango King Astor Piazzola’s (1921-1992) Tango Etude #2, which Muresanu played fabulously, as she did in the wild “Cricket Dance” by fiddler Mark O’Connor (B. 1961) for which she donned a black cowboy hat at a raffish angle and got the chance to use her high heels to tap. It was quite a show, done to perfection. Muresanu and Larget-Caplan saved the best for last—“Almost Like Being in Love” from “Brigadoon” by Frederick Lowe and Allan Jay Lerner. The version they used, which was as good as a version can get, was by the American Jazz violinist Joe Venuti (who played it with Angel Romero). Muresanu absolutely let loose and the the duo was just great. I hope they do more together. In her excellent program notes, Muresanu explained how she put the program together. Beginning with mostly encore pieces she knew and the great Bach Chaconne and the famous Paganini Caprice, she looked around for pieces from more far flung destinations—Iran, Ireland, China. “Perhaps,” she writes, “I would love to play violin music from other countries and styles: French, Spanish, Hungarian, Klezmer, Turkish, Japanese, Australian, even Balinese… perhaps some other time.” I will definitely show up for that recital.